Affice vacant frae 11 Februar 2011 tae 30 Juin 2012. 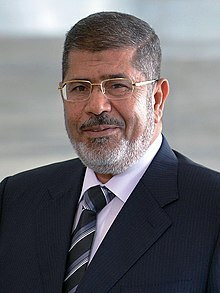 Mohamed Morsi[note 1] (Arabic: محمد محمد مرسى عيسى العياط‎, ALA-LC: Muḥammad Muḥammad Mursī ‘Īsá al-‘Ayyāṭ IPA: [mæˈħæmmæd mæˈħæmmæd ˈmoɾsi ˈʕiːsæ (ʔe)l.ʕɑjˈjɑːtˤ]; born 8 August 1951) is a Egyptian politeecian who servit as the fift Preses o Egyp, frae 30 Juin 2012 tae 3 Julie 2013. Mohamed Morsi wis educatit in Egyptian public schuils an varsities; he wis later grantit a scholarship frae the Egyptian Govrenment tae prepare for a PhD degree in the Unitit States, Morsi wis a Member o Parliament in the Fowk's Assembly o Egyp frae 2000 tae 2005, an a leadin member in the Muslim Britherhuid. He acame Chairman o the Freedom an Justice Pairty (FJP) when it wis foondit bi the Muslim Britherhuid in the wake o the 2011 Egyptian revolution. He stuid as the FJP's candidate for the Mey–Juin 2012 presidential election. On 24 Juin 2012, the election commission annoonced that Morsi wan Egyp's presidential runaff against Ahmed Shafik, the last prime meenister unner deponed leader Hosni Mubarak. Accordin tae offeecial results, Morsi teuk 51.7 percent o the vote while Shafik received 48.3%. As he haed promised durin his campaign, Morsi resigned frae his poseetion as the heid o the FJP efter his victory wis annoonced. Efter Morsi grantit himself unleemitit pouers tae "protect" the naition in late November 2012, an the pouer tae legislate wioot judicial owersicht or review o his acts, hunders o thoosands o protesters began demonstratin against him in the 2012 Egyptian protests. On 8 December 2012, Morsi annulled his decree which haed expandit his presidential authority an removed judeecial review o his decrees, an Islamist offeecial said, but added that the effects o that declaration wad staund. George Isaac o the Constitution Pairty said that Morsi’s declaration did nae offer onything new, the Naitional Salvation Front rejectit it as an attempt tae save face, an the 6 Aprile Movement an Gamal Fahmi o the Egyptian Journalists Syndicate said the new declaration failed tae address the "fundamental" problem o the naitur o the assembly that wis tasked wi draftin the constitution. On 30 Juin 2013, mass protests eruptit athort Egyp cryin for the Preses's resignation. This wis follaed bi the airmy's threit that if the protesters' demands wur nae met bi 3 Julie it wad step in an big a road cairt for the kintra, while insistin that it did nae want tae rule the kintra. Some teuk this tae mean a militar coup, but the next day the airmy denied that thay wur referrin tae a possible militar coup. The plan set up bi the militar includes suspendin the constitution, dissolvin the pairlament, an establishin a new admeenistration heidit bi the chief juistice. Morsi wis declared unseatit on 3 Julie 2013 bi a cooncil consistin o the defense meenister Al-Sisi, Mohamed ElBaradei, the Grand Imam o Al Azhar, an the Coptic Pape. ↑ Regardless of the pronunciation, also spelled: Muhammad, Mursi, Morsy. ↑ "Vice president quits as Egypt votes on constitution". Reuters. 22 December 2012. Retrieved 22 December 2012. ↑ Conal Urquhart (30 June 2012). "Mohamed Morsi sworn in as Egyptian president". The Guardian. Retrieved 1 July 2012. ↑ Hamza Hendawi (16 June 2012). "Egypt votes for president tae succeed Mubarak". Google. Associated Press. Retrieved 1 July 2012. ↑ "Morsi: Egypt's international commitments unchanged". Voice of Russia. Information Telegraph Agency of Russia. 24 June 2012. Archived frae the oreeginal on 12 August 2012. Retrieved 12 August 2012. ↑ Abigail Hauslohner (12 February 2011). "Ruling Egypt After Mubarak: Presidential Contenders Emerge". Time. Retrieved 1 July 2012. ↑ "World Factbook 2011". Central Intelligence Agency. 2011. Retrieved 1 July 2012. ↑ "مرشح الاخوان المسلمين محمد مرسي اول رئيس لمصر بعد مبارك". Google News (in Arabic). Agence France-Presse. 24 June 2012. Archived frae the oreeginal on 12 August 2012. Retrieved 12 August 2012. ↑ "Muslim Brotherhood candidate Morsi wins Egyptian presidential election". Fox News. 24 June 2012. Retrieved 24 June 2012. ↑ David D. Kirkpatrick (24 June 2012). "Named Egypt's Winner, Islamist Makes History". The New York Times. Archived frae the oreeginal on 12 August 2012. Retrieved 12 August 2012. ↑ Hendawi, Hamza (28 November 2012). "Egyptian courts suspend work tae protest Morsi decrees". Salon. Retrieved 8 December 2012. ↑ David D. Kirkpatrick (26 April 2012). "President Mohamed Morsi of Egypt Said tae Prepare Martial Law Decree". The New York Times. Egypt. Retrieved 8 December 2012. ↑ McCrumen, Stephanie; Hauslohner, Abigail (5 December 2012). "Egyptians take anti-Morsi protests tae presidential palace". The Independent. Retrieved 5 December 2012. ↑ 15.0 15.1 "Egypt's Mursi annuls controversial decree, opposition says not enough". Al Arabiya. 9 December 2012. Retrieved 9 December 2012. ↑ Hendawi, Hamza; Michael, Maggie (2 July 2013). "Outlines of Egypt army's post-Morsi plan emerge". Associated Press. Retrieved 2 July 2013. ↑ "Morsi told he is no longer the president". Washington Post. Archived frae the oreeginal on 3 July 2013. Retrieved 3 July 2013. This page wis last eeditit on 5 Mairch 2018, at 08:13.